Is what I am providing so far useful? or is it too dry? I want this blog to not only give me a constructive outlet to show off my abilities, but also inform, give feedback to myself and the world on products, procedures, and give people YOU the working knowledge to be able to go out there and seek the “right” procedure that will make you happiest and give you the gratification you are looking for… with regards to your skin care needs and care. I will never stop learning and I want you my readers to tell me what you want to learn about, what you have questions about, is there things you wouldn’t ask someone face to face (maybe a bit embarrassing in nature) but it’s something you still have a nagging curiosity about? please feel free to ask me!!! I am not only a Licensed Esthetician, I am also a certified Medical Assistant, a mother to a nearly 9 year old child, I have a highly inquisitive mind myself and if I want to know something… I’m typically one of those people that will either ask or find the truth/answers for myself. I am not afraid of delving into the unknown to find details and I will be happy to try and attempt to same for you. DO not be afraid to ask… the only bad question in my opinion is the one not said. Someday I want my little blog to “grow up” and I have happy thoughts about it not only giving people a view into what I love and what I do every single day… but I also want it to provide you with the information for what you need answered… find a place in your area, wherever that area might be, possibly give reviews for locations in your area, or IF you like someone in your local area… please let me know and post it in the section for that. I want this to grow and help you… regardless of what that help may consist of. I hope you will enjoy this blog as much as I am enjoying creating it… and I hope to hear from you! Good or Bad comments are always learned and I do try to improve by even the worse critiques. This is to cover the many essential and often times overlooked “electric” machines that you will find in most Spas and Esthetic rooms you visit. 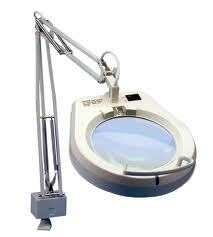 The magnifying lamp (also referred to as a loupe pronounced “loop”) magnifies the face or body part to help the Esthetician see, treat, and analyze the skin. The lamp uses a cool fluorescent light bulb. The magnyfying has various powers known as diopters. Most lamps in the industry come in values of 3, 5, and 10 diopters, which means 30 times the power of magnification, 50 times the power of magnification or 100 times the power of magnification. When the Esthetician or Technician is using this over your face for a long period, you should have something covering your eyes, preventing the blight light from bothering you. Developed by an American physicist Robert Williams Wood, it filters black light that is used to illuminate fungi, bacterial disorders, pigmentation problems, and other skin problems. The Wood’s lamp allows the Esthetician to conduct a more in-depth skin analysis, illumination skin problems that are ordinarily invisible to the naked eye. Under the lam, different conditions show up in various shades of color. For instance, the thicker the skin, the whiter the fluorescence will be. Pigmentation that shows up under the Wood’s lamp cannot be completely lightened with products or treatments because the pigmentation is in the dermis. (The thick layer of living tissue below the epidermis that forms the true skin). Many Estheticians consider a steamer one of the most important machines used in esthetics. There are many benefits to steaming the skin. Steam helps to stimulate circulation. It also softens sebum and other debris. 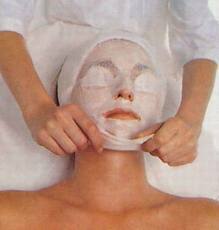 The warmth relaxes the skin and tissues, making it easier for the Esthetician to extract comedones. Stema can be beneficial for the sinuses and congestion. Steamers with ozone (O3 ) may have an antiseptic effect on the skin that is beneficial in treating acne and problematic skin. Still you should be aware that if your skin if inflamed or overly sensitive, too much steam isn’t a good thing; because it dilates the capillaries and follicles, causing more redness and irritation. 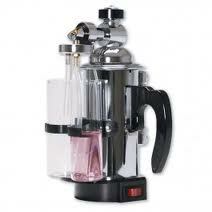 Steamers come in a wide variety of styles and shapes and sizes. They should only be used with distilled water or filtered water, due to the mineral and calcium deposits in tap water that can damage a machine. The vapor is directed towards the skin’s surface by a nozzle at the end of the arm. Steamers usually have a place for an aromatherapy ring on the inside of the nozzles hard, and they may have a special feature for oils as well. Please keep in mind, THIS IS YOUR facial/procedure, you have the control over what is happening to your face. Your Esthetician should never be too far from you during a steaming procedure and you should be given the knowledge on how to push away said steamer nozzle in the chance she/he has to step away during a longer period of time while you are laying on the table during treatment. WHY? If the steam becomes too hot, if you start to feel claustrophobic (which does occur frequently) you need to be able to voice this, if your Esthetician is stepping away, then you should be informed to know how to get the steam out of your face or at least further away to lesson the heat and feeling that you are having a hard time breathing. Steamers are suppose to help you relax, if you are in a panic mode, this isn’t what is suppose to happen, and make sure you feel comfortable with how the steamer feels and where it’s aimed onto your face/skin. The vacuum (suction) machine serves 2 main functions. One is to suction the dirt and impurities from the skin. The other is to stimulate the dermal layer and blood circulation. This function thought to help reduce the appearance of creases, such as laugh lines and improve the overall appearance of the skin. This machine can be used after desinscrustation (see Galvanic Skin Therapy or Treatments…) Is can also be used in place of the facial massage. It should never be used on couperose skin with distended or dilated capillaries or on open lesions. Glass and metal suction cups come in different sizes and shapes depending on their use. Spray mists are beneficial in calming and hydrating the skin. The machine is part of the vacuum machine and is attached via a hose that is connected to a small plastic bottle with a spray nozzle. This bottle can be filled with a freshener solution or toner (1 part toner; 2 parts distilled water) to gently mist the client’s face after cleansing or another treatment step, such as the facial massage. Invented by Dr. Lucas Championniere. It is the most unique of all atomizers and sprays. The Lucas sprayer is used to apply a very fine mist of plant extracts, herb teas, fresheners, or astringents. The mist is excellent for treating dehydrated, mature, and couperose skins. 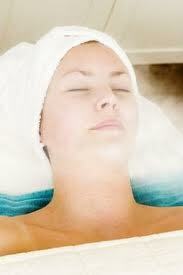 The mist can be used warm, to increase blood flow to the skin’s surface, or it can be used cool to calm couperose skin. The paraffin wax heater is used to create a warm paraffin mask for hydrating dry skin. This device allows the Esthetician to provide a treatment that offers quick results, but it lasts only for a limited period of time. Heated paraffin is applied to the face, creating an occlusive mask to hold in body heat and promote penetration of underlying products. 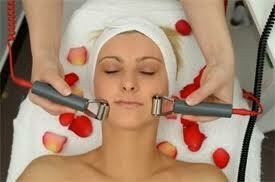 The result is a hydrating and relaxing treatment that gives you a glowing complexion. 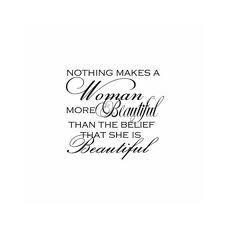 This is popular with women who want to look their best instantly, especially for special occasions. DO NOT mistake this as the same paraffin wax treatments you might currently be aware of for your hands and feet; albeit it in the same “family” of waxes, the paraffin wax that is placed onto the face is entirely different with special additives specially designed for your face. I do not recommend you attempting or trying to use your paraffin wax that you have for your feet or hands, this could be a huge mistake and cause damage or difficulty in removing said wax from your face. This is the use of electrical devices for therapeutic benefits. It is important to be familiar with machines even if you choose not to work with them. It is important to understand to be familiar with machines even if you aren’t sure or don’t think they are “right” for you. Electrical devices enhance the skin by making it easier to give a skin analysis, achieve better product penetration, or sanitize the skin. These tools are especially effective for challenging skin conditions. Machines can be used separately or as a multi-functional tool with many individual machines all on one unit. Dependent upon the Spa or Esthetician you are seeing will depend upon what you will find in the rooms and being used on your skin. New machines and technology are emerging yearly. 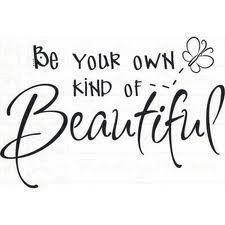 Estheticians must and should be continuously educating themselves about the latest methods in skin care. Our clients (you) are typically well informed about the particular procedure they want to have done, and you should expect your Esthetician or Technician to be knowledgeable about what it is they are doing to you or recommending. Always be sure you are working with licensed and well educated professionals. There are several contraindications for electrotherapy. Preventing physical harm to ones client is and always should be number one. Please make sure you are aware of ALL the below reasons why you may not be a great candidate for any skin care that pertains to an electric machines. If you have the below conditions, please seek your doctors approval, plus bring a “note” from said doctor indicating why they feel it’s a good treatment, even though you may fall within the below contraindications. Otherwise, a licensed professional will typically never perform these procedures if they are made aware of your below conditions. There may also be more contraindications for each individual machine depending on the manufacturers guidelines and therefore the above list is ONLY an overall list of the main factors of why you may not qualify for these procedures. Always understand that we are here to help you with your skin care, therefore we don’t want to cause harm or permanent damage to you in any way. We want you to be happy with the results and overall experience. This is a machine I like. I have found when I get that “one” stubborn pimple or area on my face that has came in the most inopportune time, this machine has helped me rid said issue much faster without a lot of redness, and long waiting for it to go away on it’s own. You need to be aware if you do use this, it may and can dry that are of your face out; you should be using a good skin care regime that will help assist you with making said dryness a thing of your past. If used properly this machine is a great tool! 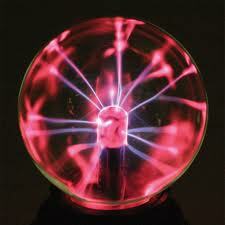 High frequency current was developed in the late 1800’s by renowned scientist Nikola Tesla. While it offers a number of functions, prior to the invention of “modern” antibiotics, it was largely used for medical purposes such as an anti-bacterial treatment for strep throat and other infections. By the 1970’s, high frequency was being used by European spas and salons, they discovered cosmetic and healing benefits of the electrical stimulation and by 1980, the the technology became widely used in North America by skin care professionals. High Frequency machines are utilizing alternating or sinusoidal currents (sy-nuh-SOYD-ul KUR-unt). The oscillating circut passes through a divice that allows for the selection of the Tesla pulse current. This current can produce a frequency of 60,000 to 200,000 hertz, depending on how it is regulated. Remember that the frequency indicates the repetition of the current per second. Because high frequency current is capable of chaning polarity 1,000 times per second, it basically has no polarity and in effect does not produce chemical changes. THis makes product penetration physically impossible. Product penetration is achieved by using galvanic current (see Galvanic Skin Therapy or Treatments…) The high frequency creates Ozone and this has a germicidal action on the skin. 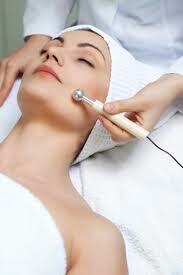 The rapid oscillation created by the high frequency machine vibrates water molecules in the skin. This can produce mild to strong heat effect. It is important to note that esthetic high frequency devices have mild effect. An exampleof stronger reaction is seen in thermolysis (thru-MAHL-uh-sus), which is used for electrolysis. This machine is a useful and versatile esthetic tool. Which can be applied after extractions or used over a product. During manufacturing process, most of the air is removed from the high frequency electrodes, creating a vacuum in the tube. The air is replaced, mainly with neon gas. However, some electrodes may also contain argon gas. As electricity passes through these gases, they emit visible shades of light. Neon gas produces a pink, orange, or red light. Argon or rarified gas produces blue or violet light. Sometimes these lights are inaccurately called “ultraviolet” or “infrared” because of their colors. However, there are no infrared or ultraviolet rays in high frequency. 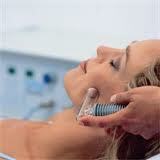 There are several types of direct or indirect electrodes available for your esthetician to use. Each has a unique or special benefit and features that produce specific physiological reactions in esthetic treatments. To avoid being burned, you should avoid contact with metal during electrical treatments. You should be aware of what you are wearing and remove all jewelry prior to your treatments. *some details above were taken from “Milady’s Standard Esthetics: Fundamentals 10th Edition” . The use of electrical current is named after Italian physician and physicist Luigi Galvani. 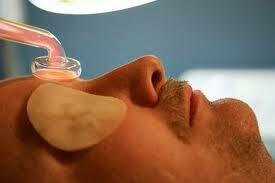 The first practical use was as a form of electrolysis or hair removal in the late 1800’s. Since then, its primary use has been as a noninvasive means for topical penetration of medications for therapeutic purposes. 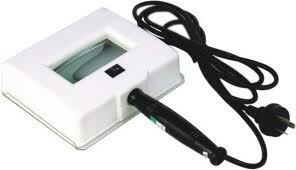 Low-level galvanic current has been used in skin-care protocols by professionals for the past 50 years. Galvanic uses two polarities—positive and negative current. 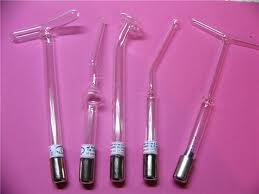 Most apparatus have a separate electrode for each. One electrode is held by the person receiving the treatment, while the other is maneuvered around the skin by the technician administering the treatment. This creates a simple circuit. The current, depending on the polarity and the acidity or alkalinity of the product, causes a chemical reaction when the electrode is applied. The Galvanic Machine converts the alternating current received from an electrical outlet into a direct current. Electrons are then allowed to flow continuously in the same direction. Creating a relaxation response that can be regulated to targe specific nerve endings in the epidermis. It is common and quite normal for the machine to leave a metallic taste in your mouth. 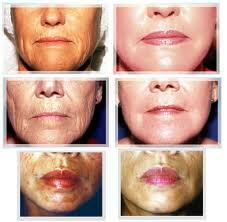 Estheticians use desincrustation (anaphoresis; an-uh-for-EE-sus) to facilitate deep pore cleansing. During this process, galvanic current is used to create chemical reaction that emulsifies or liquefies sebum* and debris. This treatment is beneficial for oily or acne skin because it helps soften and relax the debris in the follicle before extractions. In or to perform desincrustation, an alkaline-based electronegative solution solution is placed onto the skin’s surface. This solution helps soften the sebum and follicles for deep pore cleansing. The solution is formulated to remain on the surface of the skin rather than being absorbed. When the Esthetician is conducting desincrustation, the client holds the positive electrode, the positive polarity. 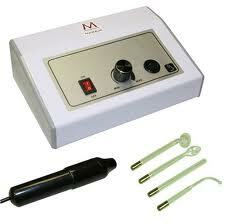 The Esthetician uses the negative electrode, set on negative polarity, on the face. This creates a chemical reaction that transforms the sebum or the skin into soap – a process known as saponification (sah-pahn-ih-fih-KAY-shun). Soap is made from fat and lye (sodium hydroxide). When the electrical current interacts with the salts (sodium chloride) in the skin, it creates the chemical known as sodium hydroxide – or lye. This soapy substance helps dissolve excess oil, clogged pores, comodones*, and other debris on the skin, while softening it at the same time. 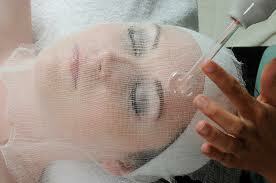 Is the process of using electric current to introduce water-soluble products into the skin. The process allows Estheticians to transfer, or penetrate, ions of an applied solution into the deeper layers of the skin. Ions are atoms or molecules that carry an electrical charge. Current flows through conductive solutions from the positive and negative polarities. This process is known as ionization (eye-ahn-ih-ZAY-shun) the separating of a substance into ions. Theoretically, iontophoresis is based on universal laws of attraction. For example, negative attracts positive, and vice versa. Similar to magnetic response, iontophoresis creates an exchange of negative and positive ions or charges. Cataphoresis (kat-uh-fuh-REE-sus): refers to infusion of a positive product. Anaphoresis: refers to the infusion of a negetive product. Couperose: skin that has dilated or has broken capillaries. **The details above were taken from “Milady’s Standard Esthetics: Fundamentals 10th Edition” . I am wanting you to take your time and give me details about your visits to your favorite spots… the best Salons, Spas and the professionals you have come into contact with! I want to provide these details for anyone to use, and maybe it will help you find a great location and professional that might have otherwise been overlooked without your help. If you had a bad experience, please feel free to critique, however, please do not be mean. Just let us know what you thought without bashing and being vulgar. If there is anything nasty or vulgar I will have to delete your posts, and I truly don’t want to do that. Please give the information about the professionals, the Spas, the salons and anything else you liked. The item on the menu you tried and have tired and what you liked about it. Tell us why you’d definitely go back… and Maybe something you would like to try when you DO go back the next time! I would like to give shout outs to the great professionals and I hope this page will one day do this as well! This area I am going to leave more open. I want to be able to have an open forum for ANYONE that has been treated by me already or will hopefully want to come see me in the future as well. I want to ask if you plan to post a reply to this part of my blog that you only be honest, truthful and please don’t cut corners. Details are great. 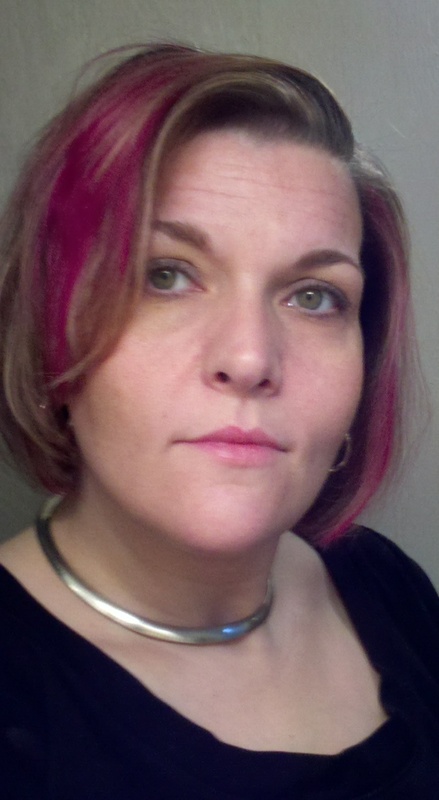 I want to know if I was a great Esthetician, and I am also want to know if I need improvement! I know without solid knowledge in my abilities and knowing I am screwing up… I cannot improve and make the best experience possible for my clients. SO please… by all means give it to me… obviously I HOPE that they will always be great… but, I will always be just as happy with someone being honest and telling me what I need to do to improve. Please refrain from just being mean. 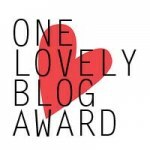 I like to know I need improvements, however, we all have to deal with so much negativity in this big world… I just don’t want my blog to become a sporting event to put me or others down. So… please let me know what it is I did, the service that is. When it was, what you liked, anything you enjoyed… please feel free to say what you want. If there could be room for improvement… please tell me! I am ready for the good and the bad! I will be placing an additional page for you to review Spas, Estheticians in your particular area and places to miss and places to definitely make sure we visit and whom to ask for!!! 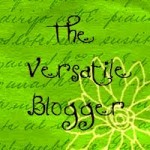 So please feel free to use that part of my blog too! I want this to be user friendly and add to everyone’s experience, not just me and my own benefits, I want to help others in my profession as well!